Study Smart Tutors Inc was founded to help schools and college access programs prepare students for high school, college, and career success. We serve the needs of our partners by providing classes for students, trainings for teachers and staff, and workshops for families. We offer our services free for students and families thanks to the support of our partner schools and programs. Our staff remains committed and passionate about providing college and career programming to students regardless of economic or demographic background. We accomplish these lofty goals by employing the most competent educational leaders to develop curriculum and to instruct students in ways that are unique, interactive, and academically challenging. The SAT and ACT exams are arguably the most significant exams that a high school student will take. With more students applying to college each year, and budget cuts limiting the number of students accepted into incoming freshman classes, these tests are now more important than ever. How many points on the SAT separate a student who gets accepted vs. one who is rejected from his/her chosen college? According to a Wall Street Journal report, only 30 points separated students who were accepted from those who were rejected. That’s only 3 or 4 total questions on the SAT! These exams measure how much money your family makes. Unfortunately, it is widely known that there is a very strong correlation between family income levels and SAT Scores. 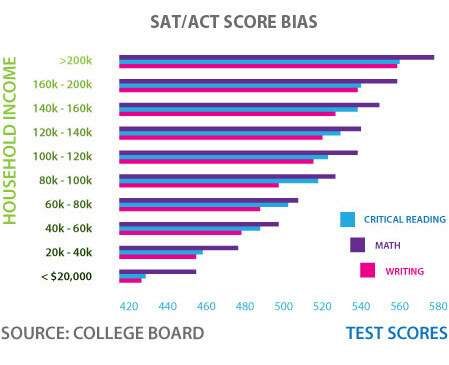 The above chart represents data from the College Board for students who took the SAT in 2009. You may notice that as income increases by $20,000, SAT scores rise by approximately 12 points in EACH section!